With Valentine’s Day fast approaching, I thought a fragrant gift guide would be in order. One of our favourite brands, L’Occitane, just happens to have a great assortment of romance-minded scents to enjoy at home and on the road. Their downtown Vancouver shop (Canada’s second flagship store following Yorkdale, Ontario) is stocked with colourful packaging, its interior reminiscent of an atelier, with high ceilings allowing natural light to pour in rain or shine. Already familiar with L’Occitane’s product line, I knew straight away what fragrances would suit a romantic-themed article. Roses et Reines celebrates all things floral. The pink and red packaging with a gold antique style font evokes a forgotten era. The scent’s primary notes are roses culled from Grasse (France), Bulgaria, Morocco and Turkey, enhanced by a unique rose extract from Haute-Provence that’s obtained by enfleurage, a process that takes fresh flowers and repeatedly presses them into a thin layer of oil until the oil becomes saturated. Three travel-friendly products in this line — solid perfume, hand & nail cream and roll-on eau de toilette — are perfect for spoiling your Valentine with the romantic aroma of rose. 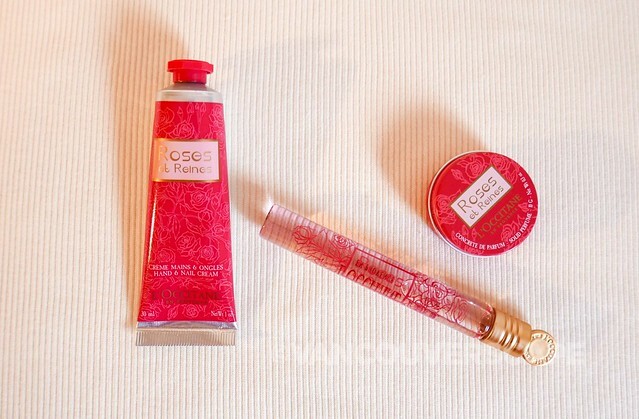 What I like about L’Occitane’s solid perfumes is that they seem to last forever. I still have my tin of Eau du Val solid perfume in a toiletry bag that’s crossed the Atlantic more times than I can remember. The roll-on is packed in a 10ml glass tube with a convenient screw top/medallion design that opens and closes by holding the medallion and twisting. This ensures a solid, leak-proof closure for taking in your purse or carry-on bag. As mentioned earlier, the solid perfume comes in a portable 10 gram tin. Roses et Reines Hand & Nail Cream is also easy to take along, the familiar velvety floral scent in a cream that’s enriched with shea butter and vitamin E. Its light formula envelopes the skin with just enough fragrance to not overwhelm. It also helps strengthen the nails. This 30 ml tube is the little sister to the larger 75ml version. 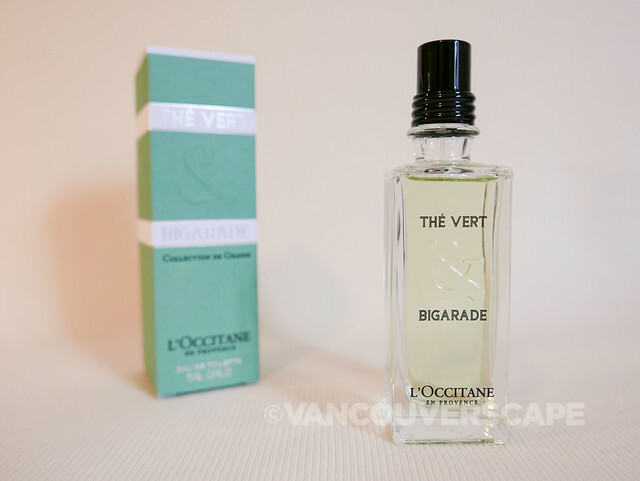 Fragrance is such a personal thing, but thinking about romance, impending spring blossoms and wellness brought me to L’Occitane’s Thé Vert et Bigarade eau de toilette. This newer addition to the French beauty line is inspired by Provence’s Grasse, known as the fragrance capital of the world. Japanese green tea extract is married with Mediterranean bitter orange essential oil to create a classic, fresh fragrance. This one can be used by both women and men so if you’re thinking of spoiling one another, this fragrance is great choice! As I’m spraying a bit on my wrist, the best way to describe Thé Vert et Bigarade is soft and cirtrusy. It’s not as ‘bright’ as the L’Occitane’s Lemon Verbena eau de toilette, as the orange slightly sweetens what is normally more a lemon-forward scent. This one is poised to become a fast favourite for us. Another lovely Valentine’s gift for someone on the go is L’Occitane’s mini creams. If you’ve ever been inside a L’Occitane store, you’ll be familiar with their large variety. 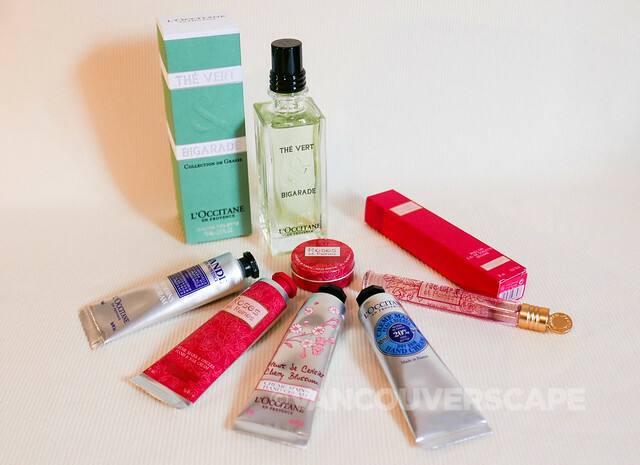 Priced at $12, it’s easy to gift in a series, or pair with another item in a particular fragrance line. Alongside our tried-and-true friend, the blue-labelled Shea Butter Hand Cream, there’s Lavender, Cherry Blossom, Almond, Lemon Verbena, Arlésienne, Peony and others. February in Vancouver also signals another favourite time of the year, when the cherry blossom buds start to appear around the city. This makes Fleurs de Cerisier a popular choice, its delicate, mildly-sweet smell perfect for a fragrant hand cream. This one smells amazing coming out of the tube! Another sure-fire way to spoil your sweetheart is with lavender. 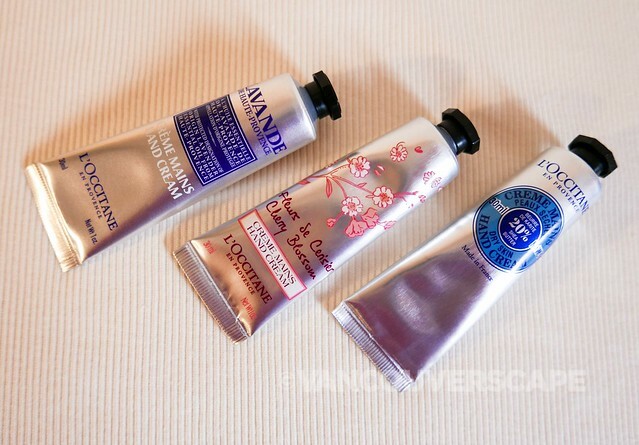 L’Occitane’s lavender hand cream is by far one of their most popular items, that relaxing lavender scent worked into a light cream enriched with shea butter. We’ve used several of L’Occitane’s lavender products throughout the years and the scent is consistent and glorious in all. Visit L’Occitane online for more ideas.